Gene grew up in a musical household and has a passion for arts and media; having a Father who was a church organist, he began playing musical instruments at a very young age. Gene began a professional music career in his teen-age years as a guitarist and singer/songwriter. His musical career was put on hold to pursue a career in Martial Arts where he became a successful gym owner and published author who was featured in several books and DVD series. In 2013, after a series of life-chaging events he was called from martial arts to ministry. Gene then devoted his life to Christ and spent the majority of his time using his professional knowledge of music and media to serve at C3 Church. He finished Theology School and now serves as a pastor at C3 church in Naples florida. Gene is passionate about the study of theology and the Greek language. He continues his work as an author - but now writes on a different subject. Gene Simco (born March 23, 1974) is a professional Martial Arts Instructor and Author who holds the rank of 2nd Degree Black Belt in Brazilian Jiu-jitsu (BJJ) under Marcelo Nigue and Amaury Bitetti. He is best known for being the first American Author to publish books on Brazilian Jiu-jitsu in the English language; his most popular titles include Brazilian Jiu-jitsu Basics, Mastering the Essential Techniques and Brazilian Jiu-jitsu, The Master Text. Gene is a well known BJJ and MMA trainer and has produced Champions of Brazilian Jiu-jitsu at a Pan American and World level. He is owner and head Brazilian Jiu-jitsu Instructor at New York Martial Arts Gym in New York's Mid Hudson Valley and The US Representative for BItetti Team under Amaury Bitetti, the First 2x Absolute World Champion of BJJ. Gene Simco began his martial arts training at the age of 9 in order to help with focus, discipline and coordination after being diagnosed with learning disabilities. He was born into a family of musicians and made music a priority over martial arts during his teen-age years. He eventually became a professional musician, but returned to martial arts training full-time in his early 20's. Gene began training in several different styles of martial arts including Aikido, Jeet Kune Do, Boxing, Kickboxing, Wrestling, Arnis and Traditional Jiu-jitsu. In the early 1990's, Gene was inspired by Royce Gracie's performance in the early Ultimate Fighting Championship. Coming from a traditional martial arts background that focused on self defense, the effectiveness of BJJ in a No Holds Barred fight impressed him. There were no BJJ schools in the area where Gene lived, so he began traveling all over the country to seek out instruction. In 1997, Gene opened NYMAG (New York Martial Arts Gym), the first "Martial Arts Gym" in the Hudson Valley area where several styles were taught; this was long before "MMA" was a popular phrase or sanctioned sport. Gene hired instructors who taught their respective styles at NYMAG and personally taught Traditional Jiu-jitsu in which he held the rank of Black Belt. He continued to travel and train at different BJJ schools in order to improve the curriculum at his academy. Through this training, Gene eventually earned rank in Brazilian Jiu-jitsu and when he reached Purple Belt, he removed his traditional Jiu-jitsu Black Belt and proudly wore his purple belt in order to set an example for his students and to make it clear to customers that he was teaching Brazilian Jiu-jitsu. It was typical at this time for Martial Arts instructors who held Black Belts in other styles to add Brazilian Jiu-jitsu to their program before achieving rank, but not remove their Black Belt while teaching BJJ, thus creating confusion to customers who thought they were learning from a BJJ Black Belt. Being a student of the art and learning authentic Brazilian Jiu-jitsu properly was always a priority to Gene, so he hired Brazilian Jiu-jitsu Black Belts to teach at his school and became a student in his own academy. Gene employed several different instructors over the years at NYMAG and was always interested in learning different approaches and styles of BJJ; he would later attribute this as one of the things that made his instructional products and personal teaching so well-rounded. NYMAG was now the Hudson Valley's first Black Belt Brazilian Jiu-jitsu school and the first to bring Vale Tudo (the father of MMA) to the area. Gene's school was far ahead of its time and offered a complete Brazilian Jiu-jitsu program where all aspects of fighting were taught: No Rules (Vale Tudo), Self Defense and Sport Jiu-jitsu. Gene began to notice that unlike traditional martial arts, Brazilian Jiu-jitsu lacked a formal curriculum and could be difficult for some students to learn. He began organizing his notes and would eventually turn them into the first "Brazilian Jiu-jitsu Student Handbook" published in the English language. He began publishing weekly moves and founded Jiu-jitsu.net, becoming the first to offer Illustrated Online Brazilian Jiu-jitsu Techniques. The demand for Gene's books grew, and so he published more versions that eventually became what is now the largest BJJ book ever written, Brazilian Jiu-jitsu, The Master Text. Gene would eventually become published by other companies and add instructional DVDs to his catalog of work, which now sell world-wide. After ten years of training, he was awarded his Black Belt in Brazilian Jiu-jitsu by Brazilian Champion Marcelo Nigue Sandes in 2005. Gene is a Black Belt in BJJ Certified by the IBJJF and is one of the few Americans to hold a Black Belt Diploma signed by Robson Gracie from the Federação de Jiu-Jitsu do Estado do Rio de Janeiro, the official certifying organization for the Gracie style of Jiu-Jitsu. His certificate was presented to him by World Champions Marcelo Nigue and Amaury Bitetti. 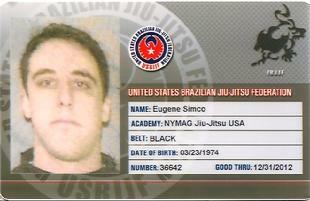 In 2011, Gene was promoted to 2nd Degree Black Belt by Marcelo Nigue (4th Degree Black Belt under Amaury Bitetti) and made the US representative for Bitetti Team under Amaury Bitetti. Coming from a traditional Martial Arts Background, Gene has always had an interest in Combatives and Self Defense; he is a member of the Special Operations Combative Arts Association and has received numerous accolades from the Military and Law Enforcement communities. 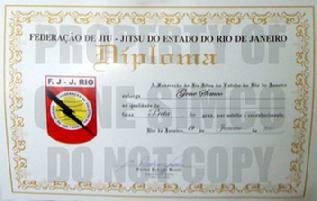 Gene continues to teach Brazilian Jiu-jitsu at New York Martial Arts Gym in Wappingers Falls and New Windsor, NY. He also trains in Muay Thai at NYMAG and still considers himself both a teacher and student in his own school. Several of Gene's students have won at the IBJJF Pan Am and World Championships, most notably, Steven Olivier, who is now a BJJ Black Belt. Brazilian MMA Champion Glover Texeira also trained with Gene and earned his Blue and Purple Belts in BJJ from him. 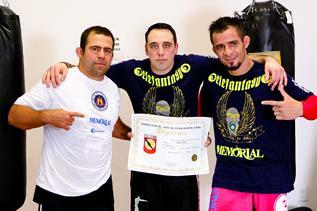 Cosmo Alexandre trains with Gene and was promoted to purple belt by him and his teacher Marcelo Nigue. Gene cornered Gan McGee for the Pit Fight Team at the UFC.